The QYT KT-780 PLUS mobile covers in RX and TX 136-174 MHz or UHF 400-480MHz (single-band VHF or UHF) in analog FM mode with 100 watts maximum (VHF). Functions: scan, quad display, 4 frequency alternate watch, repeater mode, CTCSS, DTMF, 1750Hz tone, VOX, 200 channels, frequencies step 5K, 6.25K, 10K, 12K and 25K and price 3.5mm speaker / external earphone. Comes complete with: 1 QYT KT-780 PLUS (VHF or UHF), 1 microphone, 1 microphone clip holder, 1 bracket and screw for mounting, 1 car power cable (12V), 1 manual (in English). 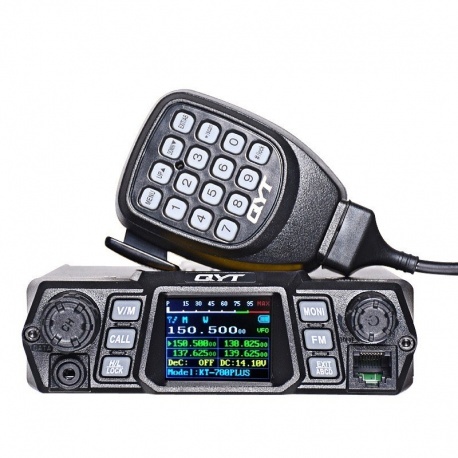 Description: The QYT KT-780 PLUS mobile covers in RX and TX 136-174 MHz or UHF 400-480MHz (single-band VHF or UHF) in analog FM mode with 100 watts maximum (VHF). Functions: scan, quad display, 4 frequency alternate watch, repeater mode, CTCSS, DTMF, 1750Hz tone, VOX, 200 channels, frequencies step 5K, 6.25K, 10K, 12K and 25K and price 3.5mm speaker / external earphone. Comes complete with: 1 QYT KT-780 PLUS (VHF or UHF), 1 microphone, 1 microphone clip holder, 1 bracket and screw for mounting, 1 car power cable (12V), 1 manual (in English).